Nanga Parbat is the second-highest mountain of Pakistan. It is in Gilgit Baltistan, between Chilas and Astore. Nanga Parbat means "Naked Mountain". It is the ninth highest peak in the world, at 26,660 feet (8,130 m) high. In 1953, an Austrian German named Hermann Buhl was the first to climb it. Nanga Parbat is in the west of the Himalayas, and is the most western of the mountains higher than eight thousand meters. It lies just south of the Indus River, in the Astore District of the Northern Areas in the region of Kashmir. Not far to the north is the western end of the Karakoram mountains. Nanga Parbat is the highest peak in the Nanga Parbat Range. The range covers an area of 120 mi (190 km) in length and 12 to 24 mi (19 to 39 km) in width. In the east it joins the Pir Panjal Range. The steep incline of its peak that rises above the ground far below make Nanga Parbat a difficult and dangerous climb. Many deaths in the mid and early 20th century gave it the nickname of "killer mountain". 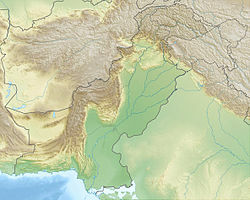 Wikimedia Commons has media related to Nanga Parbat. This page was last changed on 5 March 2019, at 16:28.